The $400,000, grade 1 Secretariat Stakes at 1 1/4 miles on August 11 at Arlington Park looks like the logical spot for Catholic Boy to continue his brief but drama-filled rivalry with Analyze It. However, Catholic Boy isn't your normal 3-year-old grass horse. As consistent as he's been on grass last year and this year, and as incredibly gutsy as he was battling back from certain defeat to beat Analyze It in the Pennine Ridge Stakes and Belmont Derby, we really don't know for sure that he's not even more proficient on dirt, as we saw in his powerful victory in last year's Remsen Stakes, and even in his narrow defeat to Flameaway in the Sam F. Davis, in which he wasn't fully cranked after having only four easy breezes since the Remsen and needing a good sharpener coming off a mile and an eighth race over a deep track. And there is no escaping that intoxicating lure of the Travers Stakes that beckons on August 25. And the colt's majority owner Bob LaPenta bluntly pointed out on Switching Leads blogtalk radio show that the Travers is high up on his bucket list. He said he would run in the race even with Justify and Good Magic in there, that's how much confidence he has in Catholic Boy. But Justify is pretty much out of consideration, and with him out, who deserves to win the Travers more than LaPenta? He has the dubious honor of being the underbidder on Justify at the Keeneland September yearling sale, stopping at $450,000, which was $50,000 short of his purchase price. He calls it a "$70 million mistake," not to mention costing him a Triple Crown. So which road do you take with a horse who is talented enough and versatile enough to win either the Secretariat or Travers Stakes? Prestige-wise and purse-wise ($1.25 million to $400,000), the Travers would seem to be the place to step up to a higher level, stamp Catholic Boy as one of the most versatile 3-year-olds seen in years, and catapult him up near the top of the 3-year-old division. Considering what LaPenta has been through this year, nearly dying from Legionnaire's disease (read the full account of his ordeal in Bob Ehalt's story on Bloodhorse.com), you can excuse him if he believes Catholic Boy can walk on water and would love nothing more than to display his enormous talents at Saratoga in the Midsummer Derby. As LaPenta said of his battle with the dreaded disease, which elevated his temperature to a scary 106 degrees and his heart rate to 180 per minute, "I was a sixteenth from the finish line. When Dr. Saikali finally diagnosed that I had Legionnaire's disease, I definitely was at the sixteenth pole." Well, as everyone who watched his last two starts is well aware, the sixteenth pole is where Catholic Boy starts fighting back, turning certain defeat into victory. So it was only appropriate that LaPenta would emulate his horse by also fighting back at the sixteenth pole. Catholic Boy also had his share of misfortune around the same time as LaPenta's illness. When he worked prior to the Florida Derby, he bled slightly, which LaPenta called, a "one" on a scale of "five." But when he uncharacteristically failed to fire for the first time in his career in the Florida Derby, finishing an uninspired fourth, it was discovered he had bled a "four," knocking him off the Derby trail. LaPenta would have loved for Catholic Boy to return to Aqueduct, the sight of his Remsen victory, to run in the Wood Memorial, but trainer Jonathan Thomas felt at the time the Florida Derby was the best spot, especially considering the success of the Florida Derby in the Kentucky Derby. Thomas also adds to the story of Catholic Boy, who gave the young trainer his first grade 2 victory and first grade 1 victory. It was Thomas who found Catholic Boy at the Keeneland January mixed sale and purchased him privately for LaPenta after the colt was bought back for $170,000. Because Thomas, who was training for Bridlewood Farm and stabled at the farm, had found the horse and saw something special in him, LaPenta felt he deserved to train the horse. Thomas had ridden briefly in steeplechase races, but suffered a broken back and paralysis, and it took him a whole year before he could walk normally. "It was a critical injury," LaPenta said, "and the doctors told him he may never walk again." Following the purchase of Catholic Boy, a son of More Than Ready, out of the Bernardini mare Song of Bernadette, LaPenta's staff, including racing manager John Panagot, rated the colt a "C+" or a "B," but, as LaPenta recalled, "Jonathan said, ‘There's something different about this horse.'" And Thomas was no stranger to good horses, having worked for Christophe Clement, Dale Romans, J.J. Pletcher, and Todd Pletcher, as well as King Abdullah in Saudi Arabia. Panagot has come a long way in his capacity as racing manager after some lean years, and as LaPenta said, has become part of the family. He recently was approached by jockey Javier Castellano to become his agent. LaPenta agreed to let him expand his horizons, and it was Castellano who rode Catholic Boy in the Pennine Ridge and Belmont Derby. LaPenta named Catholic Boy after his alma mater Iona College, a private Catholic- affiliated institution in New Rochelle, N.Y., whose maroon colors LaPenta took for his silks. Also, from Song of Bernardette, LaPenta made the connection to St. Bernardette, who he called "the saint of hopeless causes." And finally, under his graduation photo, it read, "More than ready for success." "All the priests and nuns and bothers at Iona follow him and watch all his races," LaPenta said. Catholic Boy won his first two starts on grass, including an impressive victory in the With Anticipation Stakes, in which he overcame trouble and still charged down the stretch with a powerful rush to win going away at 12-1, running the 1 1/16 miles in a sharp 1:40 4/5. He again encountered traffic in the Breeders' Cup Juvenile Turf, but rallied to finish fourth, beaten only 1 1/2 lengths. Then came his dirt debut in the Remsen, in which he blew by the highly regarded Avery Island and drew off with authority to win by 4 3/4 lengths. That impressive score put him right on the Derby trail. Following the Florida Derby debacle, Catholic Boy returned to the grass, and his performances in the Pennine Ridge and Belmont Derby have to be seen to be believed. Words cannot do them justice, other than to say this is what is meant by the heart of the Thoroughbred. To fight back the way he did in the Pennine Ridge after being bumped was amazing enough, especially against an undefeated horse who had won all his races by daylight. But to come back and do it again in the $1 million Belmont Derby going 1 1/4 miles truly stamped Catholic Boy as something special. These were two of the gutsiest performances seen in years. And he fought back both times after being on the lead throughout, something he had never done before, being strictly a come-from-behind horse. "He is such a special horse," said LaPenta, who became choked up, fighting back tears, following the Belmont Derby. "He has brought the entire family together and has brought us new life. Family is a big part of why I'm in this game. Everyone had tears in their eyes afterward. We had 20 family members and friends there, and they were jumping up and down and crying. It was one of those rare experiences that you hardly ever get to participate in, and it will be a special memory for many many years to come. What he did in his last two starts was unfathomable, and the Belmont Derby was a culmination of all the emotions we've experienced the past couple of years and months. He's an incredible champion; a blue collar horse whose heart exemplifies what life is all about." LaPenta is happy to be sharing Catholic Boy with other partners, retaining 60% of the ridgling, while selling the rest to Sol Kumin's Madeket Stables, Siena Farm, and Twin Creeks Racing. "I'm not saying he would have won the Kentucky Derby, but he would have been a major player," LaPenta said. "To see him come back and have this kind of success was so emotional I can't even describe it. "It takes a lot of money, fortitude, and patience to own horses. I try to get younger people involved. When I tell them it's about family, they can't understand it, but it does bring people together. 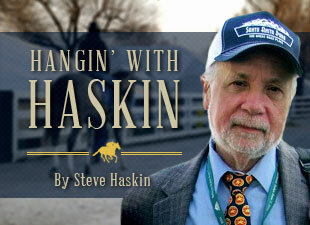 If I was at the track by myself, even winning the Kentucky Derby, it wouldn't be the same." So, as Catholic Boy approaches that crossroads, it is decision time. His future as a racehorse depends on which road they choose. LaPenta is still trying to make the memory of losing out on Justify fade into the past as he focuses on the present and future with his own special horse. Yes, he still has the marked-up catalogue page on Justify with all their comments on him, and the thought of what might have been still creeps into his psyche once in a while. But LaPenta still has a great deal to fall back on. First and foremost he has his life; he has his family and friends to share his good fortune and good times with; he has a number of other top-class horses, such as Whitmore, last year's Belmont Stakes winner Tapwrit, and grass star Hawkish. And finally, at the core of it all, he has Catholic Boy, the horse who has come to exemplify the courage of the Thoroughbred and provide LaPenta with the most important element in racing -- the promise of the future.